Start your review of Scott Shirley. Scott Shirley – I was born and am still growing up in Vernon. I graduated from Vernon Senior Secondary and went to Okanagan College for my Business Degree. I sold real estate in this area and then went into auto sales. I’ve been selling vehicles ever since. Through this most recent transition I have learned to take care of customer needs in a professional manor. I love the thrill of finding the right vehicle for the right person. When not selling cars you will find me on the golf course or out fishing, when I get the chance. 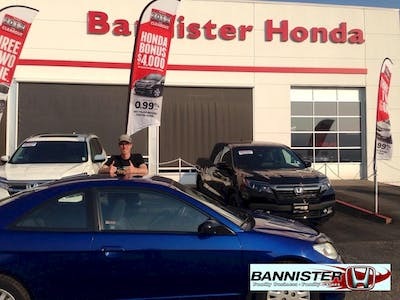 I have been with Bannister Honda since two weeks after the dealership was named back in August of 2012 but I’ve been selling Hondas for 9 of my 29 years and I love the line. Send a message to Scott Shirley. Thank You! Your message has been sent to Scott Shirley at Bannister Honda Service & Car Sales. Congratulations on your purchase of one of the best vehicles to enjoy the Okanagan lifestyle! It has been a joy getting to know you and we look forward to seeing you in the near future. Thank you for this review and your business. Many safe and happy miles. "Friendly very detailed, great follow up. A pleasant experin"
Thank you Cliff for this wonderful review and your business. It has been a pleasure getting to know you and hope we see you in the near future. Many safe and happy miles. We have been dealing with this dealership for the past ten years and including this purchase have bought 3 new vehicles. We are very pleased with the service we received. Scott , our salesman covered all the bases and was extremely helpful in all aspects of or purchase. 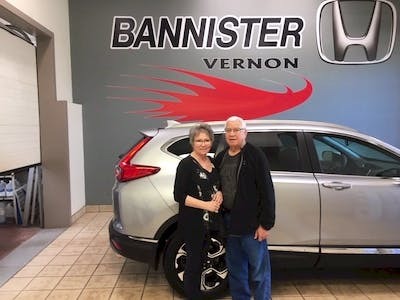 We did a great deal of research involving all makes of vehicles before this purchase and taking all into consideration we purchased another CRV. Hi TERRY.SHIRLEYW. Thank you for this glowing review and your many years of business. We know our customers are one of the most knowledgeable and informed out there. The CR-V is one of the best product's on the market today and tops for resale value. Great choice! Many safe and fun miles out there. 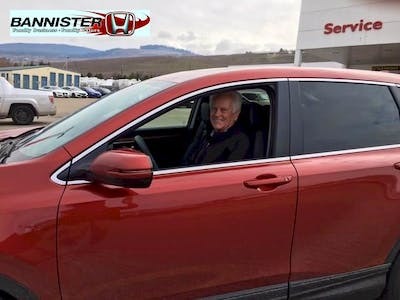 I purchased a Honda CR-V from Bannister Honda in April 2018. My vehicle was involved in an accident and written off. Due to the quick and detailed response by Bannister my experience with ICBC was quick and painless and made my search for a new vehicle seamless and effortless. Hi Watergirl. Thank u for this wonderful review about your purchase experience at our dealership. Your CR-V will keep you safe and stylish out there on the road. We look forward to seeing you in the future. Safe and happy travels. Steve at bannister Honda is seriously the best! Great customer service and very accommodating! I go to them for all my car needs, couldn’t ask for friendlier people! Thank you for this kind review and your business. We know you have many options out there for your service business so we want to exceed your expectations so you will continue to think of us for your service needs. We look forward to your next visit. Safe travels. "Just an excellent dealership no bs and friendly service. " Hi Frankie58 for your business and this review. It was a pleasure getting to know you and we look forward to seeing you again in the future. 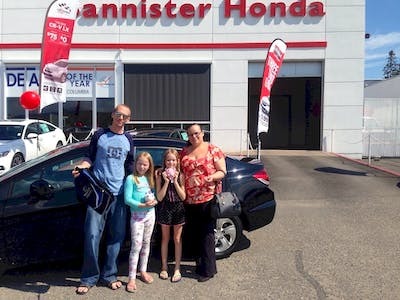 We wish you many happy and safe Miles in your new Honda! From the time I inquired online to the time I drove away in my new civic, the process went very smoothly. Udai is very good, calm, clear and a good communicator. He helped me get my payments to better fit my budget, and I didn’t feel that there was any pressure at all. Scott was also very helpful and knowledgeable, and again, there was no pressure, only facts about the cars we were looking at. Overall it was a great experience. I’ll be back when it’s time to upgrade to an SUV. Great choice Andrew93! It has been a pleasure helping you in this process. Our Team is behind you every step of the way. Thank you for your business and this great review. Many safe and happy miles ahead. "Knowledgeable and patient sales people"
I mostly dealt with Scott Shirley, but also met a saleswoman named Tracy Evans, who was very friendly, thorough and conscientious. As for Scott, he was great - friendly and doesn't push you into anything. He just gives you the information you need ad then gives you time to digest it. Shae in finance was a pleasure to meet as well, and very efficient at her job. "Exceeded my expectations, excellent service. " 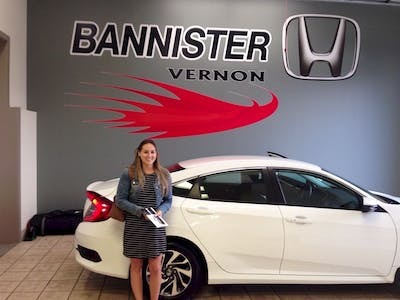 All of the staff that helped me at Bannister Honda with my very first new car purchase exceeded my expectations. 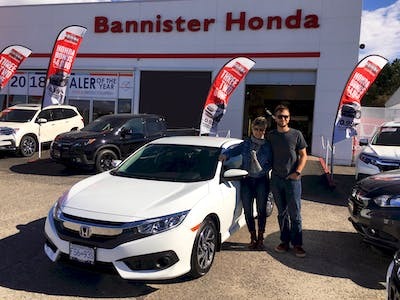 I had went to a different Honda dealership and did not feel comfortable as I did with Bannsiter, I ended up returning to Bannister as I felt comfortable and appreciated as a customer. The staff that assisted me demonstrated an immense amount of knowledge about the vehicles and finance process as well as made me feel like a valued customer. 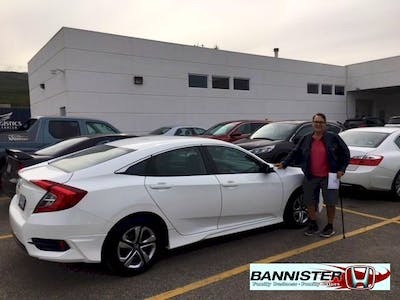 I have been loving my new Honda Civic and I feel as if I definitely made the right choice going with Bannister. I will be recommending Scott as a Salesman and all of the staff that assisted me along the way to anyone I know who is interested in purchasing a vehicle. Thank you for making my experience wonderful! Congratulations Nicole5 on the purchase of your very first Brand New Car!!! You picked a beauty too. We are honoured that you decided to entrust us with helping you make this big decision. We truly enjoyed getting to know you and look forward to your next visit. Many safe and happy miles. Scott was absolutely fantastic. He was very welcoming and friendly, and did everything in his power to help us with anything and everything. From start to finish, the experience was painless and pleasant. Udai was equally as courteous, welcoming and friendly. With assistance from his financial staff, Udai took every measure to get us the best possible deal for our money. The management staff was also incredibly gracious and grateful, making sure we knew they appreciated our business, and going that extra mile to make sure we left with smiles! This was the first time I’d ever walked into a car dealership, and I’m glad it was Bannister Honda. TyGuy it has been a pleasure serving you and your lovely family. Family is very important to us and now you are a part of ours we are here for you now and in the future. We wish you many safe and happy miles until we see you again. Thank you.